Besides the shape of the head there are other features, like hair and eyes, which affect the way how we like a doll and which impression we will gain. Basically said, the human eye likes symmetry. Everything that to us seems symmetrically and thus in harmony, we will perceive as beautiful. This applies to human faces and maybe even more so for dolls. 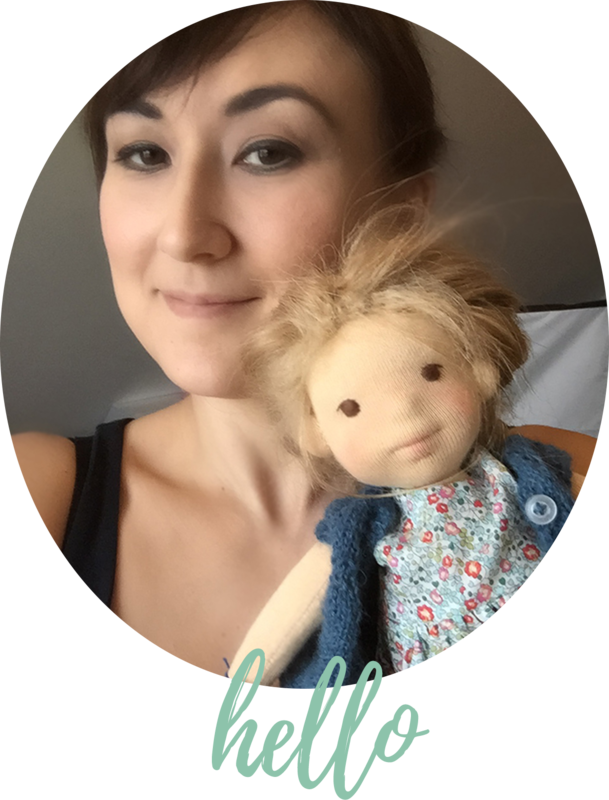 Although the classic waldorf doll ist rather withdrawn in facial expression in order to not pre-empt the imagination of the child and to remain open for interpretation and the child’s own play. 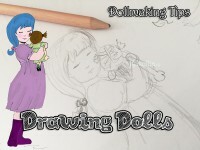 The heads and faces of the cloth/rag dolls created by many modern doll makers however, are designed more expressive nowadays. There are a wide variety of eye shapes, embroidered or painted. 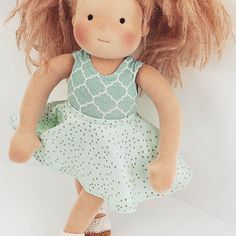 The hair rarely is still embroidered in the classic way with wool, there are so much more fun ways to do a dolls hairstyle now and there are no limits to material and color terms. Eyes are the mirror of the soul, so they say. For a doll this means the eyes are the mirror of the little dolls soul. 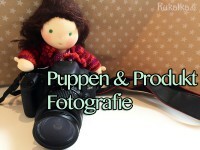 The eyes are usually embroidered or painted on the doll’s face. Some dolls have glass or beads as eyes. To make it easier to find the right position for the eyes in the doll’s face, you can try to use pins to exactly determine where the eyes and mouth should be. Just try and see what looks right for you. Eyes and mouth should form an equilateral triangle together. It may also be helpful to measure the distances with a tape measure. The eyes should be placed just below the eye line. Depending on which expression is intended for the doll to show later, the eyes should be located as closely as possible to the tyed eye line or slightly below or above. A little trick I like to also apply at this point is looking at the doll not directly but through a mirror. This way you can easily spot any asymmetries and simply correct the placement of the pins until everything seems harmonious. Also the correct spacing of the eyes themselves to each other is important. Setting the eyes too far apart from each other will make the doll look more like an animal/fish. Putting the eyes too close together will unfortunately make the doll look rather “unintelligent”. Also the eyes should not be placed too low or too close to the nose. Like mentioned earlier on the traditional waldorf doll actually has no mouth or if so, only very subtly indicated as a short straight line. Just like the eyes are either painted with a special fabric paint or embroidered with embroidery thread the mouth can be done similar. The mouth together with the eyes forms an equilateral triangle. Again, everything is possible here. There are rag dolls grinning widely, others only smiling slightly and like mention before there are dolls with no mouth at all… and the needle felted heads each have another individual mouth shape altogether. Actually, a nose is not absolutely necessary. Especially with traditional waldorf dolls this is omitted deliberately. In general the nose tends to be the most vulnerable part to contamination and abrasion. 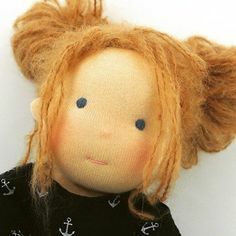 There are several methods to form a nose for your doll: Either needle felt a firmly rolled piece of wool into a little ball, or sew a little wool filled bag onto the head where the nose should be. You also could use a technique with which the nose is formed by stitching like so. In my opinion very little dolls actually do not need a nose. For larger dolls a nose can mean achieving a very own and unmistakable expression depending on placement and size. Your own imagination is the limit here. 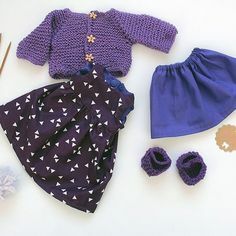 Chose what color, material and style suits you and your doll best. As often seen in the very tradition waldorf dolls, the hair can be applied by separately stitching each woolen hair/thread to the head. Or simply adding hair by sewing on faux fur. 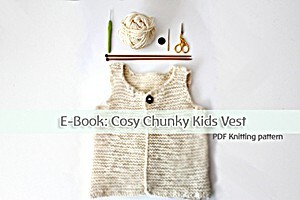 Also often a wig is crocheted of mohair wool and then the hair strands are added individually. Also some dollmakers are working with sheep wool curls, the so-called “wefts”, etc. Baby dolls often have no hair at all. That’s really left to everyones own preferences. Nowadays everything is possible, also concerning rainbow colored hair. 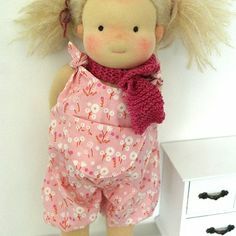 Quite typically the waldorf dolls always have beautifully bright red chubby cheeks. The red color is applied with a special wax crayon (more details here). However, one must renew this color regularly as it abrades quickly. The wax block color of the blush is now often substituted by make up Rouge, crayon or watercolor paint. Depending on how strong or slightly flushed cheeks the doll should have and whether the blush should stay on permanently, you can use different methods and materials. Even freckles can be dabbed with a damp and sharpened pencil and are an increasingly occurring stylistic device of facial features. 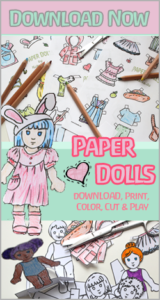 However you decide to make the doll’s face – whether one followed symmetries or colorful hair is used – fortunately the possibilities are manifold and so diverse … as well as the tastes themselves .